It all started with a book. Ashley Sutton was 17 years old, working in the mines of Western Australia, and to pass the time he wrote stories about an underground world of grumpy miners making fairies from iron, and illustrated them himself. “They’re stupid books, don’t ever read them, but the drawings are ok,” Sutton says, now 45, without a hint of hubris. One book became three, which led to the first Iron Fairies factory being built in Bangkok, Thailand, and has now become numerous F&B outlets across Asia stamped with the Sutton design signature: luscious attention to detail with a romantic, fantastical, maximalist tone; stained glass, wrought iron, and hand-hewn timber; rich colour palettes of crimson, bronze, and jade; and a general more-is-more attitude in a world where we’re KonMari-ing everything we can get our hands on. Despite that, he has a formula that works. 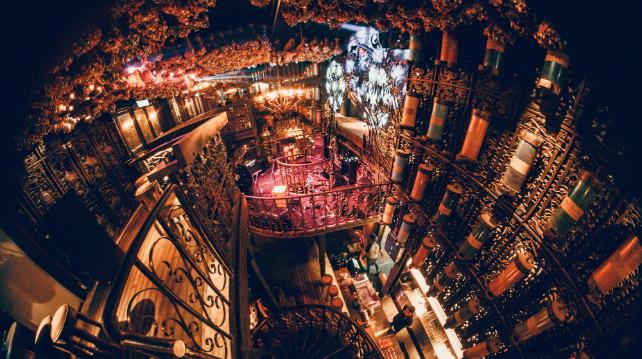 With four Iron Fairies bars in Bangkok, Tokyo, Hong Kong, and KL, Dear Lily, J. Boroski, Ophelia, Dragonfly, and a number of other F&B outlets, Sutton scoops up awards for his imaginative designs that are unlike anything else in the world. It’s a funny sequence of events that led Sutton to becoming one of the most sought after designers in Asia, but his vision doesn’t seem to translate over to his native Australia – since moving back to Perth two years ago he has bid for a couple of projects and been turned down, “My ideas are too eccentric for them…they said “your mind is too out there, customers aren’t going to like it, it’s too much, we’re not ready for it.’” Australia is too small, he grumbles, and Asia’s F&B scene is far ahead. There’s an escapism that propels Sutton’s style, a trait that personally appeals to him because, as he puts it, he hates cities. “I like to take people into another world. My outlets are in big, developing Southeast Asian cities. I suppose it’s good to take you to another place rather than traffic and concrete.” His childhood was spent building treehouses and underground cubbies, and now they’ve only grown in size. At the time of the interview, Sutton was taking a break from doing exploration work around Papua New Guinea with a BBC crew onboard his vessel, Infamis. He’ll then continue with a crew from the Discovery Channel to explore Micronesia and the Solomon Islands. He much prefers to be at sea, like an unofficial pirate, and aside from a long-standing dream to build a boutique hotel or a resort, he’d like to design boats.